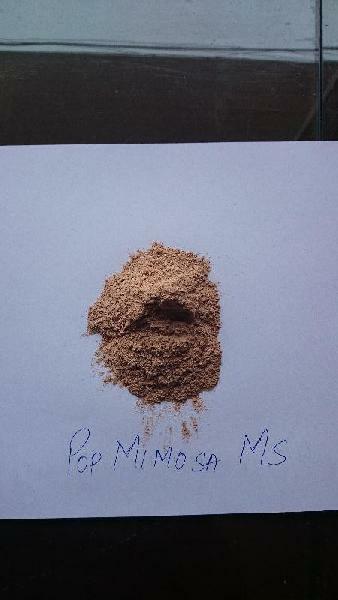 POP MIMOSA MS is a soft mimosa single bleached extract of high quality indicated for tannage of hides and skins whenever a very light colour is required. In the tannage of soles and vachettas a very nice beige tone, often desired, is acheived. To keep the embossing effect. 5-15% for chrome leather tannage. Flexible and semi firm leather. Tanning and Re-tanning of chrome box-cow. During the leather production, there may be a risk of iron contamination. In order to prevent this, we suggest to use an iron-sequestering agent such as Pop DS Powder (0.2% on the reference weight), which may be added together with the first addition of tanning agents on the tanning or retanning processes. POP MIMOSA MS maintains its characteristics unchanged if properly stored in dry premises protected from sunlight in closed bags. POP MIMOSA MS is presented in a powder form, dedusted, and packed in a 25Kg. bag net weight. Physical Aspect - Light beige hygroscopic powder, dedusted.